In the 1790s, when Irish patriots were looking for French assistance in their uprising against the British, a song called The Shan Van Vocht crystallized Irish feelings about the looming conflict. Mulligan's "when the French were on the sea" in Telemachus alludes to a line in the song, and in Cyclops Ned Lambert repeats this nugget of Irish cultural memory: "Since the poor old woman told us that the French were on the sea and landed at Killala." Once in 1796 and twice in 1798, the French sent fleets to Ireland to aid the enemies of their imperial rival, Great Britain. In December 1796 the large Expédition d'Irlande, commanded by General Lazare Hoche, failed to land at Bantry Bay in very bad weather, dashing the revolutionary hopes that had been raised by Wolfe Tone's embassy to the French government. 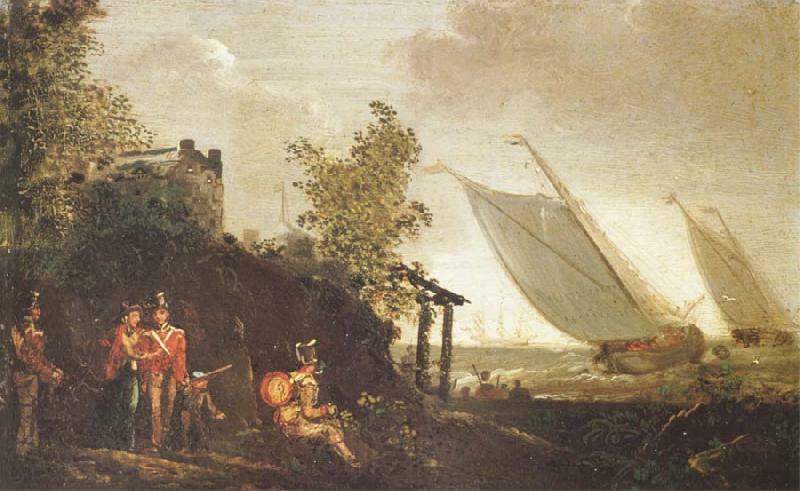 In August 1798, well into the Rising that had begun in the spring, the French landed ships at Killala, in County Mayo. The troops transported by those ships joined forces with Irish rebels and enjoyed some initial success, but were soon defeated. In October another French force attempted to land in County Donegal, but was defeated at sea by the Royal Navy. Wolfe Tone, on board one of those ships, was captured and sentenced to die. 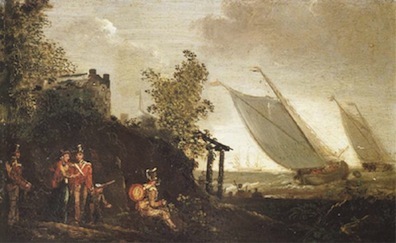 The French in Killala Bay, oil painting by William Sadler, displayed in the National Gallery of Ireland, Dublin. Source: www.nationalgallery.ie. Liam Clancy and Maura O'Connell singing The Shan Van Vocht. Source: YouTube.